I guess that it's common knowledge that there's not one Li'l Bad Wolf but three? 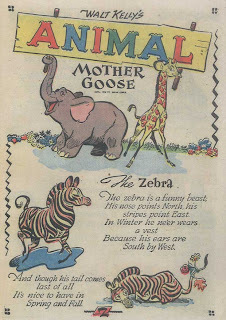 But in case you havn't seen them before, here's a sunday from 1938 with great artwork by Al Taliaferro. Going through my files at home I found these. 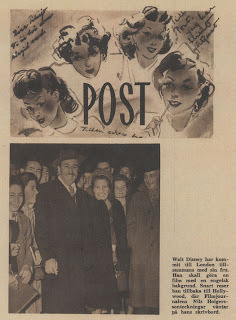 From Filmjournalen 1947 (and with thanks to Simon Bülow) here are pictures of the cells that the winners got from Disney in the Nils Holgersson competition. All were signed by him personally and I know that Rune Andréasson got the one with Mickey. Apparently there has been a showdown between the Smurfs and their arch enemy in Gothenburg this September. No less than 4 times! My girlfriend treats me like a rat!!! Then we have the actual competition page from the following issue. By designing the lead character Nils Holgerssonj you could win 1000 crowns and an original drawing signed by Disney. As you can see there are some familar faces in this picture. Looks like they are studying some desert scenes? 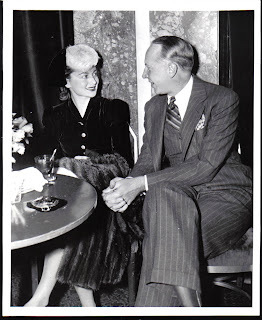 The next picture is also from 1946. It's taken in London and according to the text he is supposed to do a picture set in England. I wonder if there were similar competitions in other European countries at the same time? 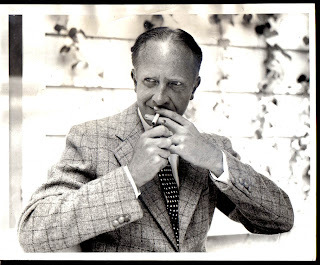 The studio might not have been interested in doing Nils Holgersson at all but launched competitions in several countries just to get some attention after the war? 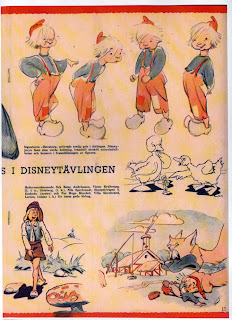 Has anyone seen any documents relating to Nils Holgersson at the Disney archives? 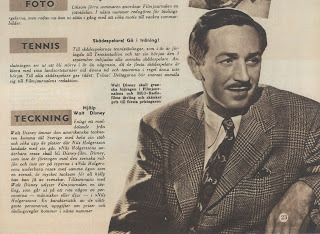 Thanks to Simon Bülow I now have copies of more articles from Filmjournalen regarding the Walt Disney - Nils Holgersson project! 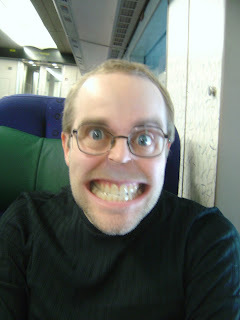 Later this evening I'll meet my good friend Germund. 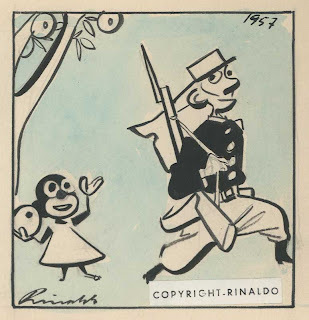 We'll select original art and do a dummy for a special section of an upcoming issue of Bild & Bubbla. 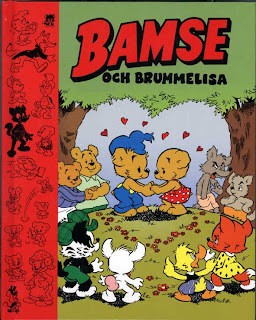 The last two issues of B&B has featured special sketchbook sections with odd and unseen art by well known swedish comic book artists. 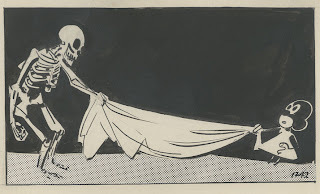 But this one will focus on gems from mine and Germunds collections of original comic book and strip art. 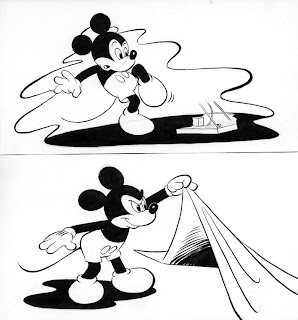 There will be plenty of old newspaper strips and some really rare Disney art. And some modern pieces and Scandinavian artwork of course. 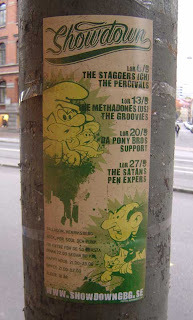 Look for it in 2009. If everything goes as planned it will be printed in time for next years bookfair in Gothenburg. Going through the original art makes me really inspired to get back to the drawing board. So confident lines and wonderful use of black and white spaces. 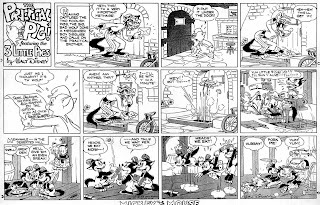 I'd call BaBa Swedens answer to Americas Krazy Kat in a way. 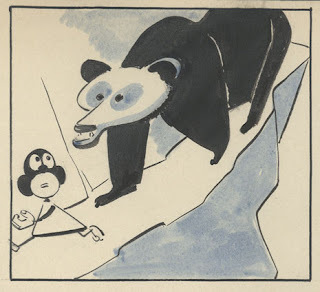 Its whimsical, strange, funny and graphical in a way seldom seen in newspaper strips. Some times you have no idea what's going on and some time it's just absurd and crazy. Since the publication date of the book is so far away I just have to treat you with a few panels scanned straight from the original art. The panel above is from early in the run and the ones below are from later dates. 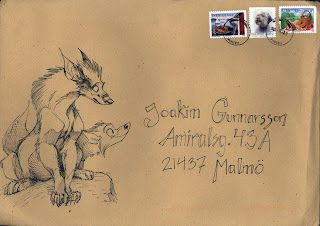 Got some pencils from Hedvig yesterday and I hope she don't mind me sharing the art she made on the envelope. Coming home from work and seeing this on my floor when I opened the door just made me happy. :) Thanks, H! 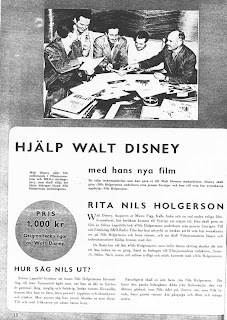 Back in 1946 the Walt Disney Studios probably got idea of doing something with Selma Lagerlöf Swedish best seller "Nils Holgerssons underbara resa genom Sverige" (Nils Holgerssons wonderful journey through Sweden) from 1906-1907. 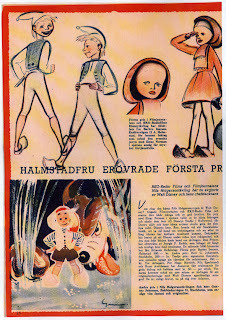 So together with the magazine Filmjournalen and RKO they launched a competition in Sweden to find a good design for the lead character. 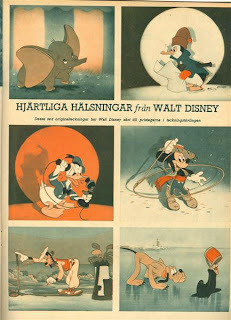 Maybe they had no intention of animating Nils Holgersson at all, but it was a good way to get some publicity here in Sweden after the war. And well known Swedish artist Einar Nerman was in the Swedish jury! A colleauge, Björn Ihrstedt at Egmont in Stockholm, sent me copies of the article that announced the winners. 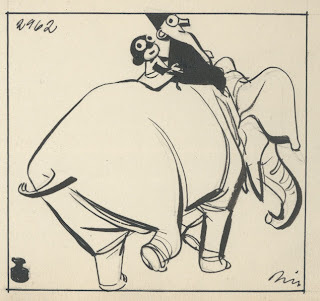 As you can see the winner was Barbro Isacson who went on to illustrate and write several childrens books. The latest was published in 2003! And two of the runners up are familar for Swedish comics fans: Rune Andréasson and Nils Egerbrandt. But there's a mystery here too! The four drawings top right won third prize and were sent in by the signature "Östratorp". When the winners were announced the real name of the illustrator was still unknown. I wonder if they were made by someone who already had a career as an illustrator or animator? Anyone who recognize the style? 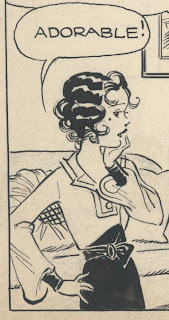 Or knows who the artist is? 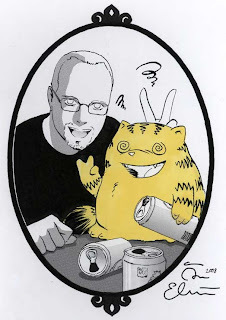 We had a hangover breakfast at my flat this morning and I was given this drawing of me toghether with Nils the Cat. :) (Nils is the yellow fat one to the right.) It's drawn by one of swedens most well known manga artists: Åsa Ekström. 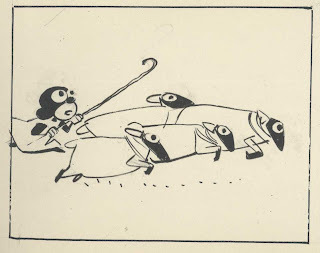 Just to get your brain cells working: Name the strip and the cartoonist behind this drawing. The name of the strip should not be too hard to figure out. 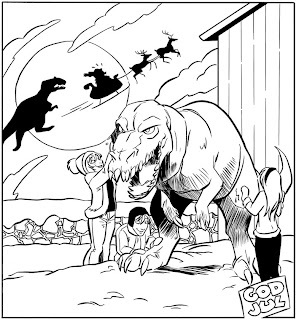 But the cartoonists name might be tricky. 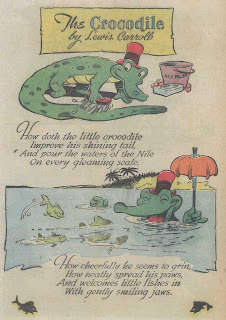 Almost forgot about the Walt Kelly "Mother Goose" pages I made copies of a while ago. I think I promised to post a few more. Now let us all bug Fantagraphics about a nice anthology of all Kelly's odd works when they have finished the Our Gang series. 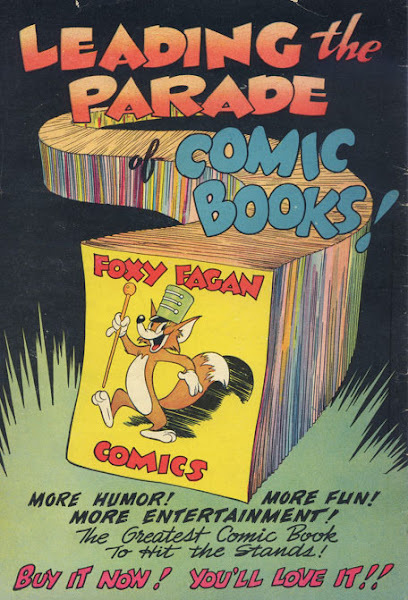 Looking forward to the Pogo books but would like to see the Pogo Comic Books reprinted even more.